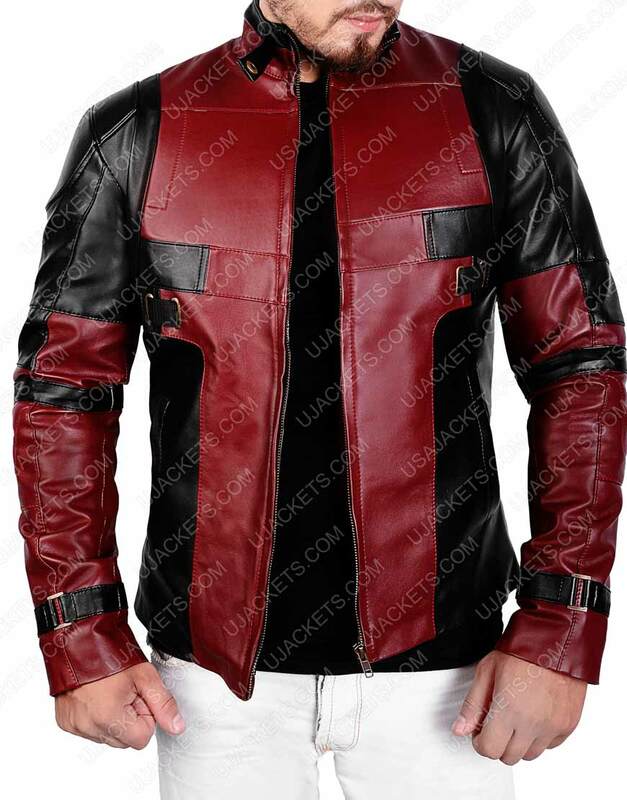 Get riveting smart presence among all with this Deadpool Jacket that is perfectly manufactured in the same way as shown in the movie, worn by ever impeccable actor Ryan Reynolds. Its creative façade styling and bold fabrication rightly makes it a top outwear to have in your wardrobe if you are a compact attiring lover. Made from the quality genuine/faux leather material, the outfit is boldly fashioned with the trendy snap tab collar on its upper side, and has been affixed with the full zipper conclusion on it frontage for intrepid compact looks. 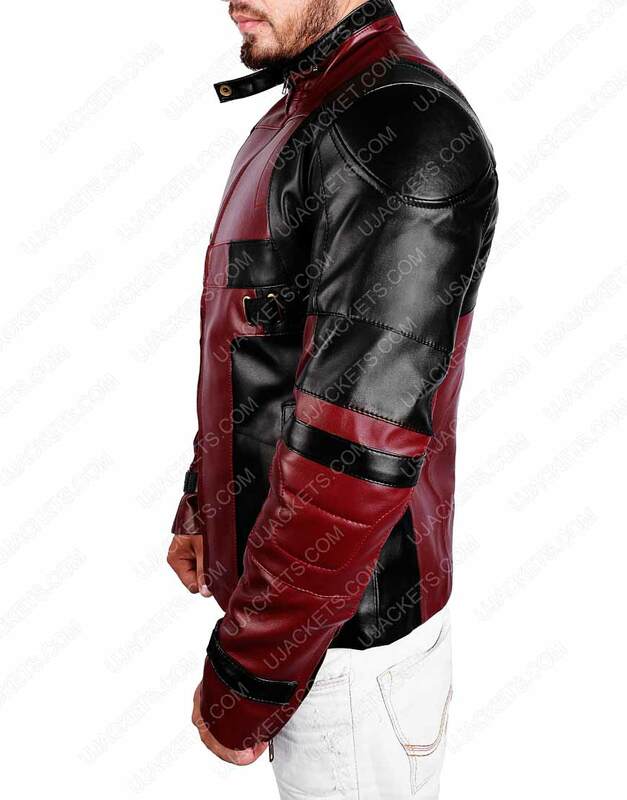 This Deadpool Leather Jacket has been crafted with the casual side waist pockets on its front also to help you keep special holdings within. Exclusively crafted outwear with intrigued quality This outwear is a one flawless piece of craftsmanship that looks exactly the same as the one Ryan Reynolds took on screen in the movie Deadpool. I really like the cognate styling of this attires and its overall designing that is why opted to buy it from here, because i wasn't able to find such outfit anywhere else. Overall, its a one fine artwork of riveting class and quality and best to wear in all events. Stunning Deadpool replica jacket. Eminent and elegant Deadpool Jacket for men.I’m looking to stick to it for the next few years or so. So considerably calm and dapper out and out. What makes this solely enticing and nail biting is its bit by bit framework construction. Looks so genuine and there's no reason that I can't relate it to the outfit as worn by Ryan Reynolds. Truly an out of the box and over the body lifetime experience for me. The genuine cowhide is supple and familiarized with the calm cool over its appropriate fortification of the genuine layer of leather. The size outline helped me a considerable measure to stay aware of my correct body part measures. Beside the fundamental S, M, L, XL… going for the size outline distinctively charted on the size chart is unquestionably the best decision I would give anyone going for the purchase here or at any place online. Best work guys. Keep it up! Wonderful jacket and got no reason to unnecessarily spout of gibberish complains. Great leather jacket!! What a great rendition that gives you exactly what you intend to have. Seamlessly designed and notched up over the top among other replicas found on the internet. Wasn't expecting a non-Amazon website to give something amazing as this one. The ascribed aspects on this Deadpool jacket were exactly as told here. Got no worries with its making and sizing. Medium is the best appropriate fit for me... 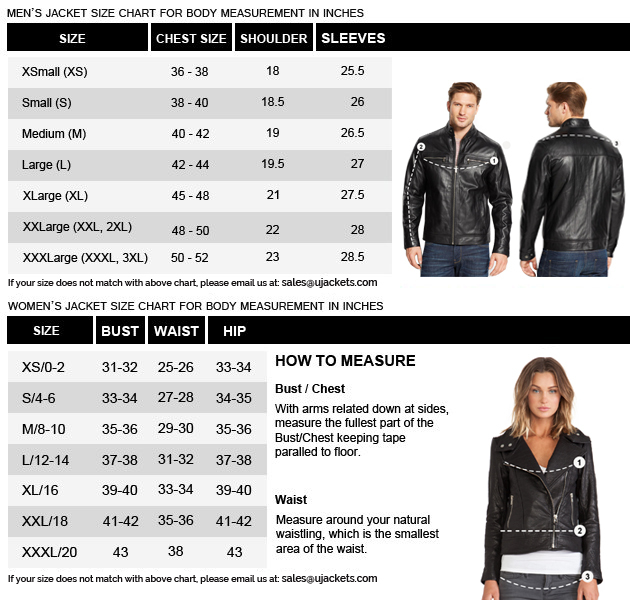 I would recommend size charts to all before clicking on to buy this one. Solid jacket to go for!! This Deadpool Jacket is lit. Good quality with great built. This Deadpool Jacket is lit. Good quality with great built. 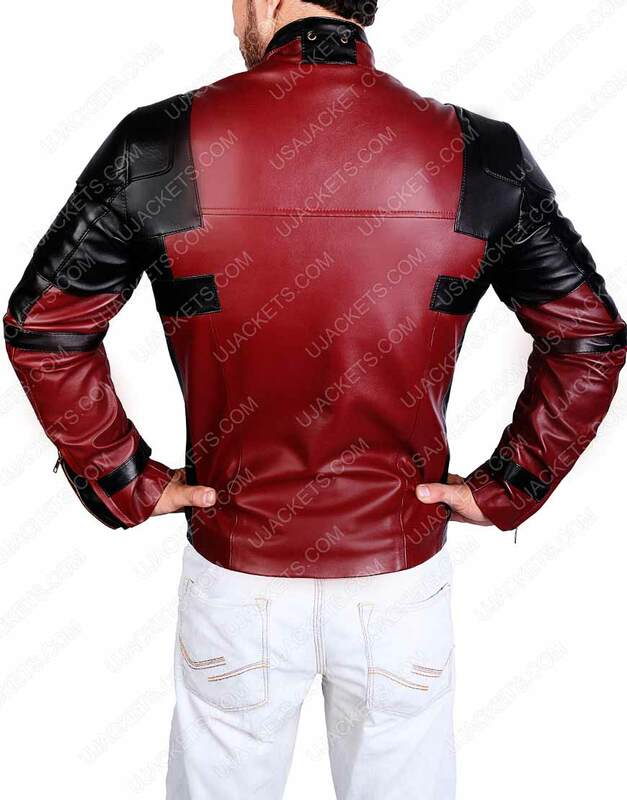 Really a nice genuine Deadpool jacket made with the perfect movie outfit attestation. The black and maroon exemplifies the same shades as worn by Wade in the film and the detailing is dead-on. The jacket reached me in a calm boxed composite manner... everything inside was in one piece and not a single fringe made its way on the premium leather surface "loved the leather smell"... felt like i was in the department where its stitching and hemming took place. Awesome attire. Must buy!! Stylish and extravagant outfit I always wanted to gimmick the personified style of Ryan Reynolds which he took on in the movie Deadpool, but couldn't able to find any outfit related exactly to that. But thanks to UJackets for crafting this meticulous jacket which looks exact same and bold as shown on screen. What i like the most about this attire is its facade designing which has been done in a unique manner to give prolific class to the garb. As an overall, a perfect attire to imitate riveting style of Ryan Reynolds and i will surely recommend this outfit to all who wants to buy something exquisite in cheap pricing. Outfit with a Specatacular Garment gimmick I received the parcel a bit late but everything looks exactly like my agenda. I had it tarnished up in the box with uneven folds. At first I was quite depressed because the shipment wasn't on the standard i was expecting. I had to press under a firm cloth so as to reassure if it was waxed as it had a radiant effect to it. I was amazed after that. Rich, finely designed, picture-perfect and dashing. 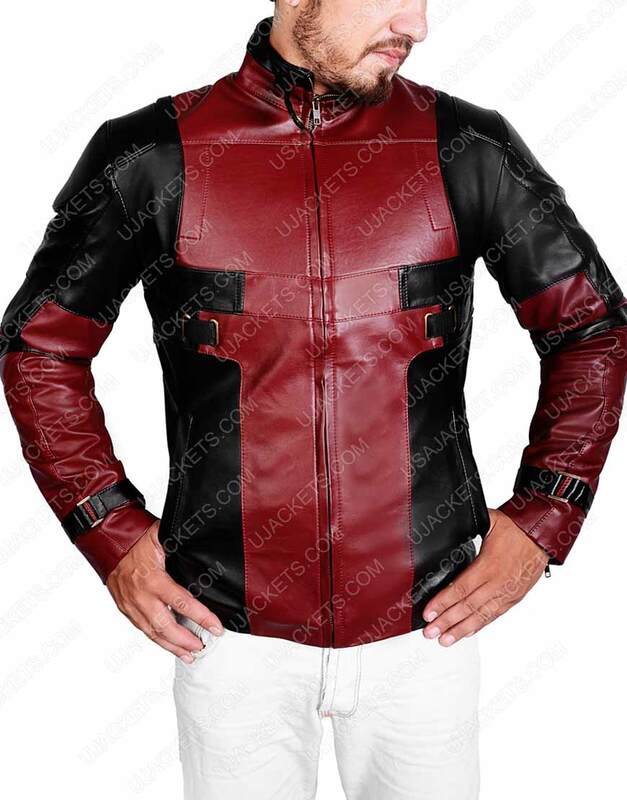 Awesome Deadpool Jacket in Maroon and Black Colors I just received my Jacket and it was exactly as advertised, great fit, soft leather & it seems like amazing quality. I can't imagine a better looking or a better made jacket anywhere. Love the rear panel and the price, overall the service i received from here is top notch, i will definitely buy new products again. It makes me feel real good... This gear of Ryan Reynolds as maroon and black Deadpool outerwear is one of my favorite, As I got it I am depicting on, during biking it blast the crap out of me and makes me feel real good. It delivers such charms that will make you remember forever. I am wearing Large size and it is perfectly fitting all too well. It gives me star studded experience. It gives me star studded experience. Ryan Reynolds Deadpool Maroon and Black outerwear is my favorite, Ever since I received it I am wearing on, while riding my bike it gives me chills and very good feeling on the road to Hollywood. As it gives me star studded experience. and charisma. I wear the size L it is fitting well and perfectly according to my body measurements. Yes, Absolutely it will be Screen Accurate, if you find it not to be as displayed you can return it without any extra charges! A Dear customer, Yes it is absolutely possible. All you have to do while placing order please make sure to mention this in the comment box.